I’m in Debrecen, in eastern Hungary, for the recording of the first album of pieces written in memory of my beloved Yodit. 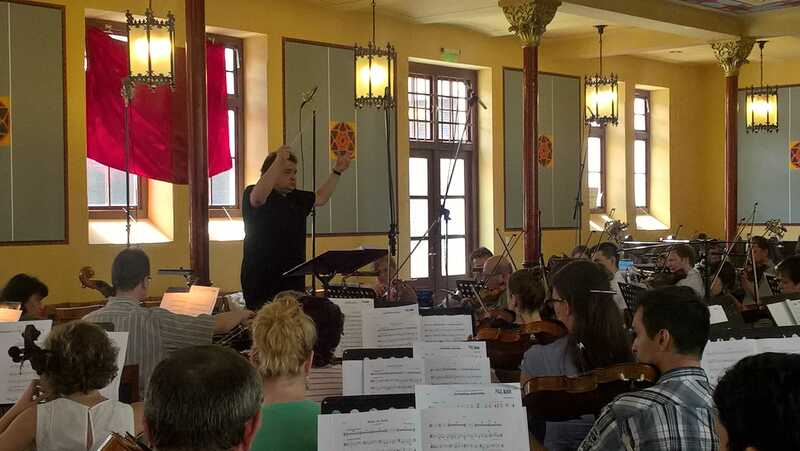 Paul Mann – who has been here for a week already, recording music by Henry Cotter Nixon, also for Toccata Classics – is conducting the Kodály Philharmonic Orchestra in eleven new works for string orchestra by Brahms (arr. Ragnar Söderlind), Brett Dean, Steve Elcock, Andrew Ford, Robin Holloway, Jon Lord (arr. Paul Mann), Mihkel Kerem, Maddalena Casulana (arr. Colin Matthews), John Pickard, Poul Ruders and Ragnar Söderlind. They will constitute the first release in the project Music For My Love. 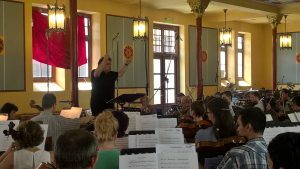 Since the Orchestra doesn’t have a recording venue of its own (using the concert hall would add considerably to the cost), the sessions are taking place in the Synagogue on Pásti Utca (Street), in the Jewish district just by the town centre. Inside the yard, on the other side from the synagogue building itself, is a wall recording the names of all 6,000 of the Jewish citizens of Debrecen who were murdered during the Second World War. 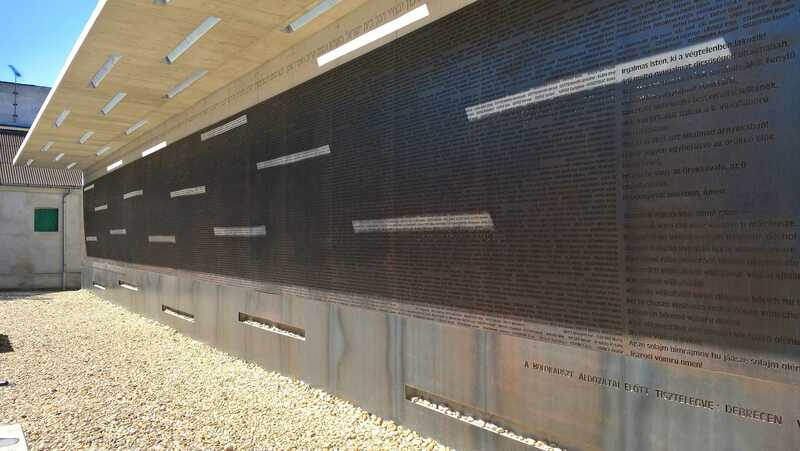 An overhang in front has slots cut into it in different positions so that, as the sun crosses the sky, strips of light pick out individual names. Than your soul, the only virtue in the world. As if they were two streams of bitter tears. We learned how we should really love quite late in our love’s life. Indeed, it’s during the initial play-through of Di vostro dipartir that the enormity of what I have undertaken really hits me – with the experience of the first of these pieces as living music, I can at last see why everyone else remarks on the ambition of the project. Because I’ve been on the inside of it all the time, while the project grew incrementally, it hadn’t really struck me that to commission and record 100 new pieces of music (and also publish most of them) is indeed a bit over-the-top. There are currently 97 composers ‘signed up’, so to speak. I was intending to take it to 99 and then write the last piece myself. But since there are still some composer friends I still haven’t got around to asking for a piece (I’ll feel guilty if I don’t), I guess that 100 will end up being a symbolic number rather than a literal figure. This might sound rather grandiose, but given that the impulse underlying the entire undertaking is to remember a lost love, it might, when it’s finished, be seen as a kind of Taj Mahal in music, if that doesn’t sound too pompous. Anyway, it’s not for me to judge. The second piece to be recorded on this first day is Robin Holloway’s Music for Yodit – a simple title which undersells the quality of the music, which, like the title, understated and moving – a warm elegy, animated in its central section with the ghost of an English dance. By now I am indeed beginning to appreciate the enormity of this project: these first two works already are major additions to the string-orchestra repertoire. An audience halfway round the world and two hundred years in the future will open their programmes for that evening’s concert – and remember Yodit. And far sooner than that, our son Alex will attend a concert (who knows, he may even be conducting it) and know that this music was written for his mum. He has lost her physical presence, but he can take some pride in this echo of her life. Last up on this first day is Andrew Ford’s Sleep, two minutes of static, rather ritualist music with high lines for the violins that suggest bright light. Andy is British-born but has lived in Australia for many years. Sleep brings back memories of a conversation with another Australian composer, Peter Sculthorpe, who told me that his music attempted to capture something of the special intensity of the light of the outback. This thought has just come to me when Paul tells the orchestra that Sleep is Coplandesque, and so I know I am on the right lines. This is going to be some week.